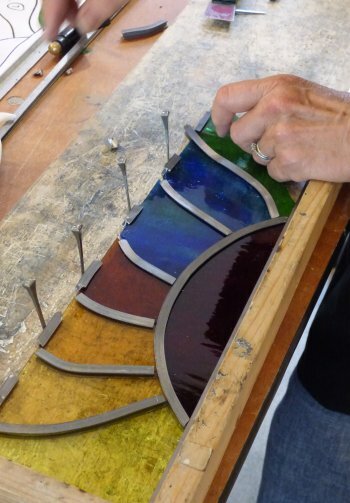 Learn the basics of leaded stained glass in just one day! 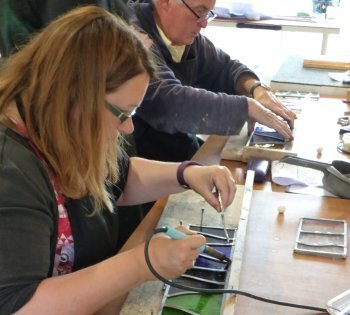 Our one-day introduction to the traditional method of stained glass construction using lead cames will give you a grounding in the essential techniques, plenty of hands-on experience with the pro-grade tools we use, and lots of tips, tricks and insight into the history of this 1300-year-old craft. We call this class our 'Garden Panel' class - you'll make a stained glass panel you can show off in your garden, or display indoors! This class is suitable for complete beginners! 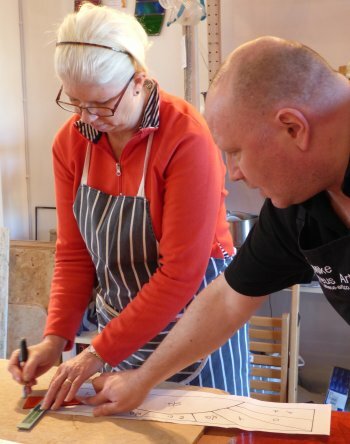 Our one day classes are suitable for anyone over 16, although we do advise that anyone with a medical condition that limits their hand strength or control contact us before booking to discuss. With a maximum of 5 students and two tutors you can be sure of plenty of attention and guidance throughout the class. We'll introduce you to all the key techniques and tools used in the traditiional method of constructing stained glass - using lead cames. As this class demands more strength in hands and wrists, we recommend the foiling beginners class to those with limited strength or control. We start out by demonstrating how we score and break glass. 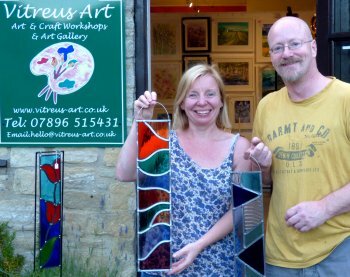 You'll then practice cutting glass to a design until you're ready to start cutting the coloured glass for your main project. This will take us up to lunchtime, and a break for some fresh air! In the afternoon, you'll work on your project piece which you'll finish in time to take home! We'll demonstrate the process of constructing a panel using the leading method. At each stage we'll discuss the tools and techniques being used and point out common difficulties. You'll then build your panel with the coloured glass you've just cut. Maximum class size 5. Bookings via Vitreus Art - use the PayPal button below to select your class date and type and then pay with credit / debit card or PayPal, or call in at the gallery. Our class bookings terms and conditions are here. 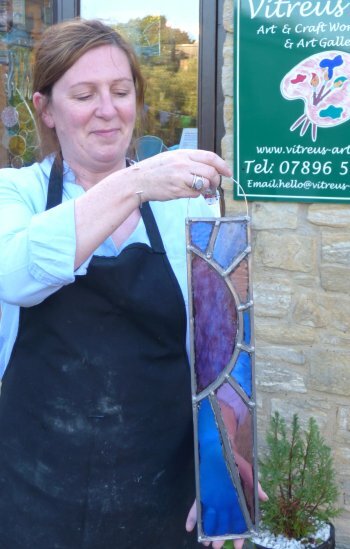 If you'd like to receive our monthly newsletters with updates on new class dates and types, plus all sorts of stained glass information, click here and subscribe. "Amazing class! I loved it." "I loved how energetic and enthusiastic Mike & Jenny were with us and about the subject.."
"Well structured and logical day. Loved it. Fun and productive." "Your passion for the subject really shone through and your professionalism in guiding us in all the task was amazing." No need to be anxious about cutting glass - we'll get you cutting confidently by the end of the day!